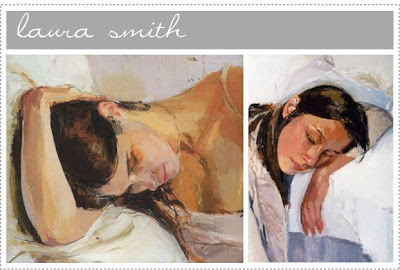 These lovely paintings by Laura Smith make me yearn for peaceful sleep. Being in my ninth month of pregnancy I haven't been sleeping too well...and as all new moms know, I won't be getting any more sleep after the baby comes (in fact it will be less...I'm sure of it). Please, all of you who can sleep soundly and peacefully, take a few extra moments to enjoy it...for me...and the rest of us who won't be sleeping until our children are grown (well OK, until they are older at least). i feel your pain, friend. even though my kids are mostly sleeping through the night now, i have learned to live on less sleep, and really appreciate the sleep i do get. i slept dreamily last night and every time it happens i wake up grateful. hang on! Poor Merrilee! Unfortuneatley I'm in college and don't get any sleep hardly either... :-P what's wrong with life that takes away an important element??? lol... luv & miss u!